Our special thanks to the Haverford High School Choirs for their inspiring performance last Friday. Here is a clip for the more contemplative moments of this beautiful Sunday. Haverford Chambers and Concert Chorale sang a full concert at the esteemed St. Patrick’s Catheral during their 2017 performance tour in NYC. They performed a sacred choral repertoire ranging from the Rennaisance through the contemporary. The concert was well attended by a large audience of tourists as well as parents, friends and HHS Choral Alumna. 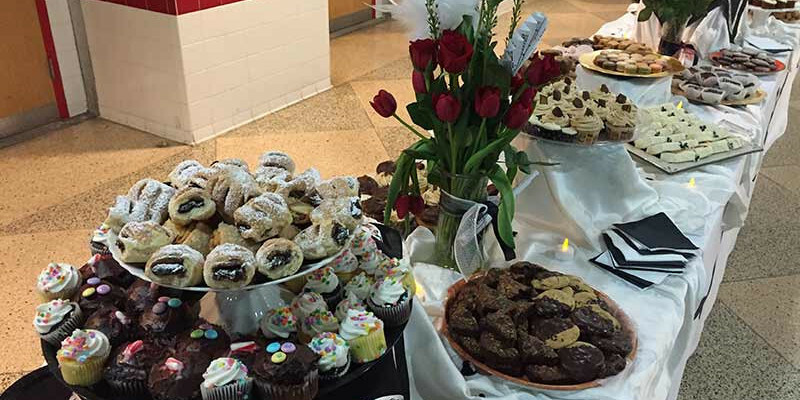 On March 4th the Haverford Choral Program held their most successful benefit concert to date! Together we raised $9362.00 for the program. These funds directly benefit Haverford choral students, providing uniforms, music, and assistance with scholarship among other program expenses. The lobby was beautifully decorated in a colorful and fun french theme, setting the tone for the evening. Guests enjoyed the opening buffet filled with delicious appetizers while perusing the amazing array of silent auction items available for bidding! Excited guests tried their luck in this years featured Hamilton ticket raffle and 50/50! Our choral friends and families truly gave from their hearts to support the program and many walked away happy winners!! Of course the highlight of the evening is always the performances. Each year the evening showcases the talents of our choral students who perform contemporary numbers individually and in small groups with instrumental accompaniment. This years finale was an outstanding performance by our award-winning Chamber Choir and Concert Chorale performing songs from Les Miserables. The Haverford Choral Association thanks everyone who made this event possible; our wonderful committee chairs and volunteers, everyone who donated delicious desserts that so gorgeously filled our intermission buffet tables, the choral students for pulling out the stops and putting on a fantastic show for their audience! And of course, Marsha core, the true heart of this choral program. Without her inspiration and belief in her students, a night like cabaret would not be possible. The Haverford Choral Association looks forward to Cabaret 2018! The Haverford Choral Arts program is excited to offer our students and families the opportunity to purchase spirit wear online until November 8th! These items will make great holiday gifts, and there is something for everybody! Show your support and order today! The Upper Darby High School Choral Music Association will host its annual invitational Choral Music Festival February 19th at 7:30 at the Upper Darby Performing Arts Center. Now in its 24th year, the festival brings together more than 750 singers from nine area schools who will take part in the concert. Upper Darby High School Choral Director Barbara Benglian points out that the festival, the only one of its kind in the area, is a noncompetitive one that promotes continued friendships and fosters inter-district musical collaboration. For students and choral directors, it is an opportunity to share repertoire and experience varied musical styles. For audiences, it is an upbeat evening of family entertainment. In addition to the award-winning Haverford High School combined choir, the festival showcases groups from Upper Darby and Drexel Hill middle schools, as well as ensembles from Conestoga, Springfield, Sun Valley and Unionville high schools. Choruses from each of the participating schools will be highlighted in performances of short pieces of their choosing. This is a highly entertaining festival that anyone who enjoys choral music will want to attend. All seating is general admission. The $3 per person admission fee will be taken at the door. Refreshments will be available for purchase during intermission. The Upper Darby Performing Arts Center is at 601 N. Lansdowne Ave., in the Drexel Hill section. Returning from their trip last Sunday, the combined high school choirs (Chorale and Chamber Singers) made their way back to good ‘ole Havertown from Pittsburgh after attempts by winter to foil their trip. The choral trip was unexpectedly shortened due to inclement weather on Thursday which delayed the departure of the singers, and prevented them from performing at the state capital. Yet, the choir prevailed under the leadership of music teacher extraordinaire Ms. Marsha Core and embarked west to commence the trip to the other side of the state, leaving Friday morning instead. Jack Frost was the one in for a surprise when the choirs took off to Pittsburgh as they were not phased by such measly attempts to ruin their trip. Upon arrival in the city of steel, the choral students had a musical masterclass with one of the country’s top choral conductors and specialists, John Goldsmith. Other highlights of the excursion included a trip to the Andy Warhol Museum, shopping in downtown Pittsburgh, and when the singers put on their dancin’ shoes for a dinner and dancing cruise on the three rivers. They also went to a Pittsburgh theater to see the hilarious Mel Brook’s Musical, Young Frankenstein. The trip concluded with a breath-taking concert in the beautiful space of the First English Evangelical Church that featured musical selections from throughout time. One crowd and choir favorite was contemporary artist Eric Whitacre‘s popular piece, Leonardo Dreams of his Flying Machine as it sounded remarkable in the magnificent acoustical setting the church provided. All of this would not be possible without the amazing work of the high school choral director and music teacher Ms. Marsha Core. Core worked tirelessly preparing, planning, and executing this fabulous trip which all of the choral students will remember for many years to come. The Fourth Annual ACDA-PA Fall Conference, October 17 and 18 at Seton Hill University in Greensburg, featured interest sessions and performances by selected choirs from Fox Chapel High School, Temple University, Haverford High School, West Chester University, Penn State University, Seton Hill University and the ACDA-PA Elementary Honor Choir. In addition to all of these performances, your $45 registration fee included attendance at the Undergraduate Conducting Competition and Masterclass with Peggy Dettwiler, and an evening performance by Seton Hill Choirs.